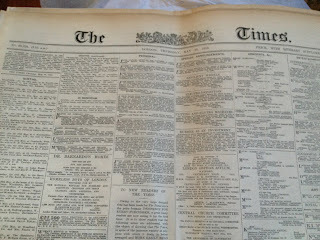 Original Historic Newspapers Make Great Gifts! 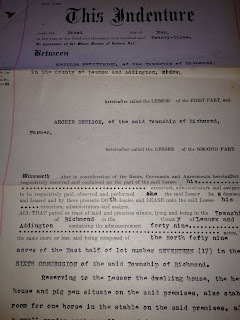 Recently I was sent two original newspapers from Historic Newspapers UK. 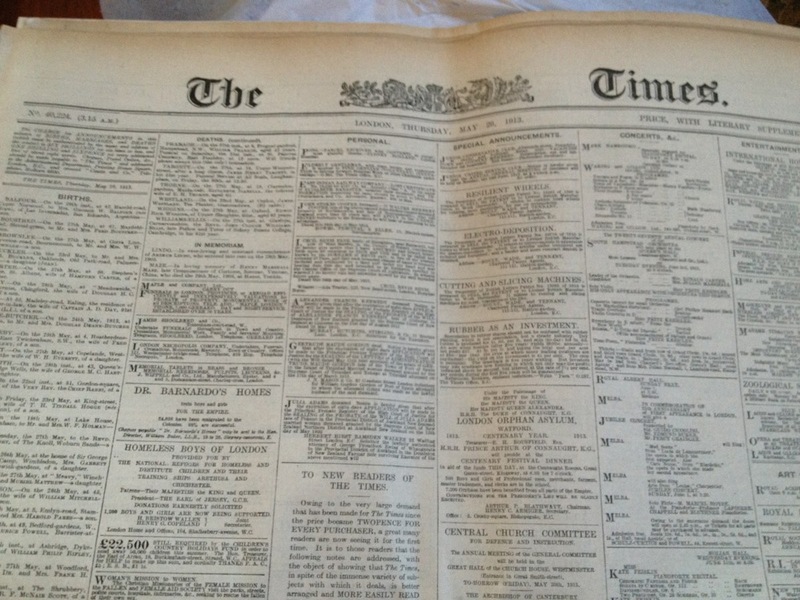 This company sells genuine original newspapers dating back as far as the 1800’s. These are sourced from the world’s largest private archive of over 7 million editions from all over the world. To date UK titles have been catalogued as far back as 1900 by date and title, there are also lots of US and regional issues, as well as many from the Victorian era. I admit that when the company first approached me and offered to send me two (free) original newspapers, I was a bit skeptical. First, why would I want them? And were they actually originals or were they copies? The company informed me that there were very few original issues for 15 May 1912 due to it following the Titantic disaster. They offered another date or a quality reproduction of that May 15th issue. 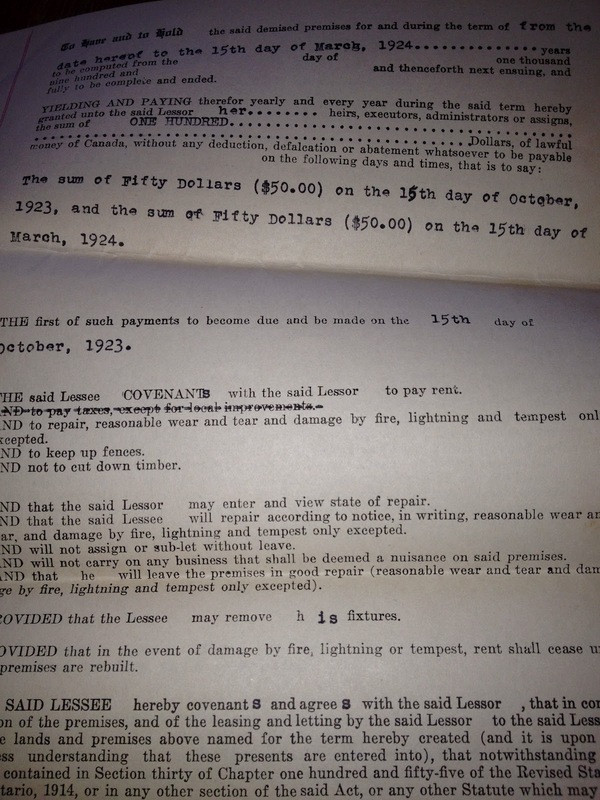 I opted for the reproduction since I wanted it to be the paper from the day my father was born. When the box arrived at my door I was pleasantly surprised! The presentation box is lovely - a nice blue box with "A Day to Remember" printed on the lid. Inside were the newspapers, carefully wrapped in tissue. 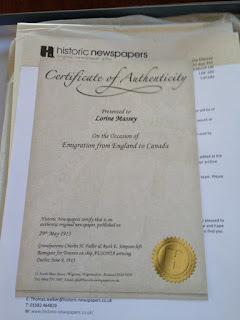 Each newspaper came with a seal of authenticity including the information I submitted online to be printed on the seal. The certificate for my reproduction paper stated very clearly that it was not an original. This is the front page of the 1912 newspaper which the company reproduced for me. I'm quite happy with the quality. 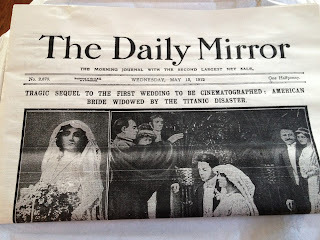 I love being able to see the headlines on the day my father was born! 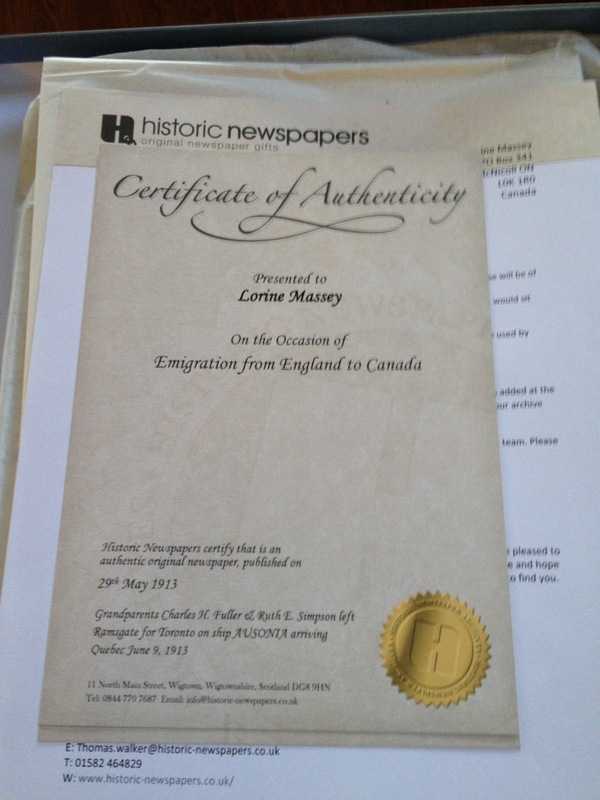 This is the front page of the original newspaper I ordered for 1913 - the day my grandparents left England for Canada. It is really interesting reading through it, and quite obviously an original. It has yellowed slightly and even has a slight "old" smell! I am quite impressed with these newspapers and think they would make wonderful gifts. I'm planning to give mine to my sons at some point. I think they will really enjoy them. Disclaimer: Historic Newspapers offered me two free original newspapers in exchange for a link to their site. I was not paid for this review nor was I told what to say. The opinions are entirely my own. (PROVO, Utah) – November 29, 2012 – Ancestry.com Inc. (Nasdaq: ACOM), the world’s largest online family history resource, today announced the launch of Newspapers.com, a powerful and affordable new web site designed to offer a historically rich collection of more than 800 U.S. newspapers dating from the late 1700s into the early 2000s. Comprising more than 25 million pages, Newspapers.com offers a trove of historical and present-day newspapers ranging from the New York Times to treasured small town and local newspapers throughout the United States. Interested users will find centuries of amazing news articles and photos now captured online when browsing hundreds of years of breaking news headlines, searching for information about an ancestor or reading how the media addressed moments in history like the day Charles A. Lindbergh flew over the Atlantic, the opening of Disneyland or news from the fronts during World War I and World War II. The search capabilities on Newspapers.com are specifically designed for newspapers enabling users to easily search by keywords, location, time period and newspaper name. From the 1784 Newport Mercury newspaper to a 2009 edition of The Gettysburg Times, users may find old advertisements or job listings, laugh at comics, retrieve family history clues or learn about famous events through the eyes and words of the time period. The user experience is also enhanced by an image viewer that serves up crisp, high-quality images of the newspapers. Once discovered, newspaper images can easily be clipped, saved and shared via social outlets such as Facebook, Twitter, Pinterest and Google+. BIg News Coming at 4 pm Today! Hi everyone! Something very exciting is happening in the genealogy world but I can't tell you about it yet. Stay tuned for the exciting genealogy announcement coming today at 4 pm EST. 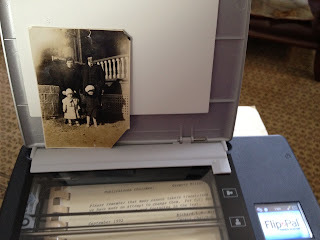 It's s biggie and you can read about it here on Olive Tree Genealogy blog at 4 pm today EST. 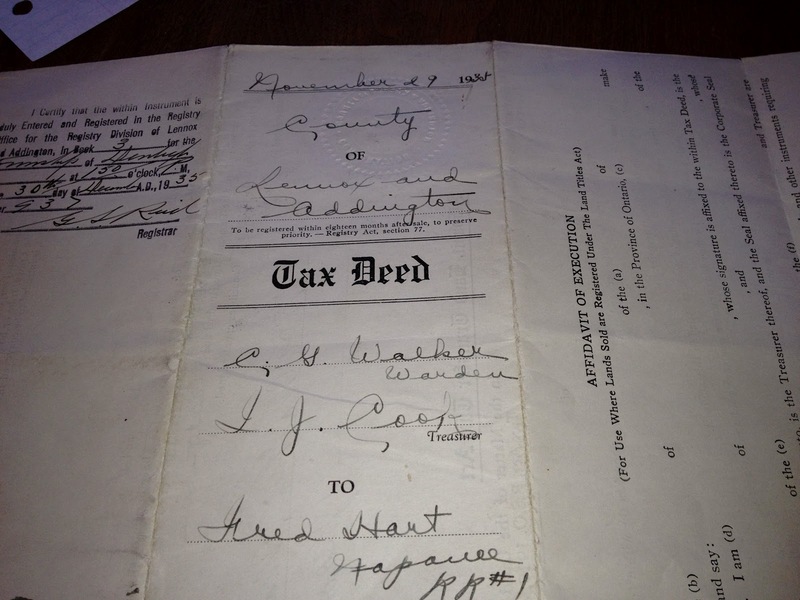 This last document in the collection is a Tax Deed dated 29 November 1938. It states that Charles W. Walker, village of Newburgh, Warden, and Thomas J. Cook of Napanee, Treasurer, grant to Frederick Hart 100 acres in the Township of Denbigh, Counties of Lennox and Addington. It is specified as Lot 2 West Range Denbigh. 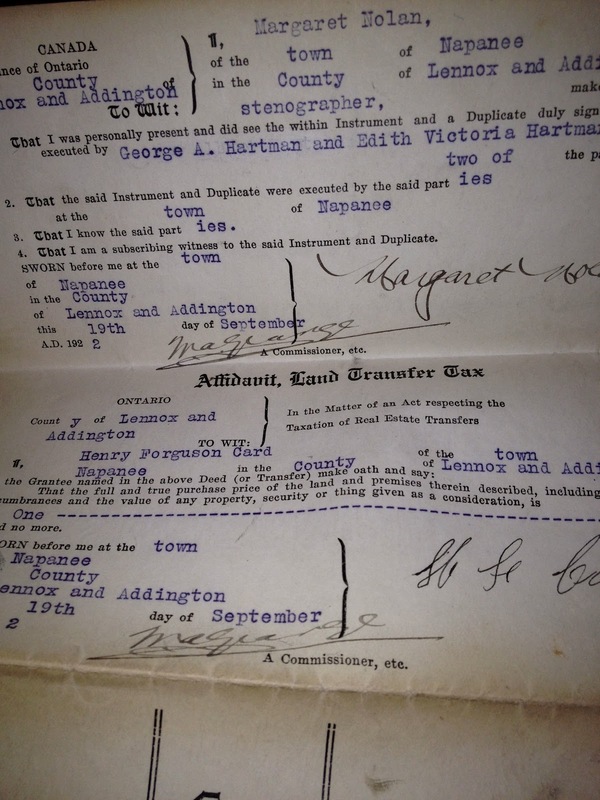 More documents will follow as I scan them and extract their details. 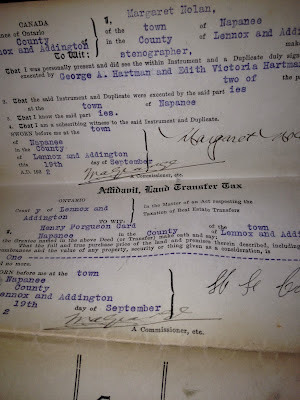 To view all documents as they are published on Olive Tree Genealogy blog, click on Lennox-Addington Collection in the tags at the end of this post. Success! 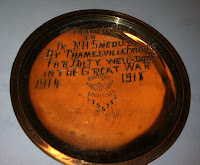 WW 1 Watch Stolen from Family 30 Years Ago Returned! 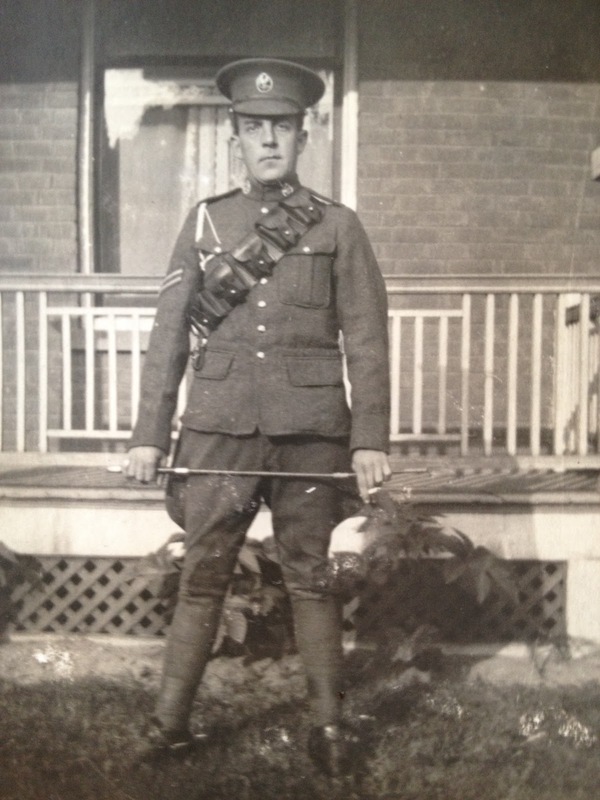 Great news - another happy ending to a search for a WW1 soldier's descendants. The original story of a watch found by a young boy over 30 years ago is here Chad found this watch in Michigan and wrote to Olive Tree Genealogy to ask for help finding the soldier R H Smedley's descendants so he could return the watch to the family. With the wonderful sleuthing skills of several of my readers, the Smedley family was found. R. H. and his son are deceased but his daughter-in-law Ann and two grandsons, Ron and Jim were found. We made contact with the family and Chad arranged to meet them personally to return the watch. 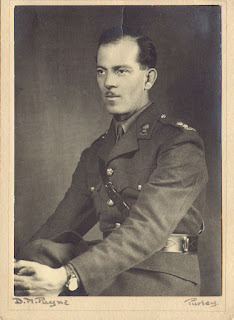 The family very kindly agreed to take photographs for me to share with my readers. The photo on the right shows Ann holding the watch which was stolen so many years ago and then found by Chad. Her son Ron (R. H. Smedley's grandson) is in the photo along with Chad who found the watch. Here is Chad's email about the reunion of the Smedley watch with Ronald Smedley's daughter-in-law and grandsons. 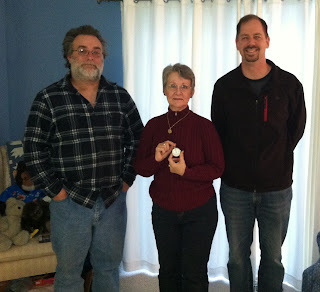 ...... We met today and I passed the watch back to Ann after it had been stolen from their home some 30 yrs old. It winds up that I went to the same high school as her sons so we lived about 1.5 miles apart. Ann was gracious enough to share with me some information about RH Smedleys service, showed me a couple of pictures and showed me some of his service medals. We had a very good visit and I am just very glad that it is back with Ann and her family. Thank you very very much for your help on this and also please thank the other kind ladies that also helped. This reunion would not have been possible without everyone's hard work. Thank you again. 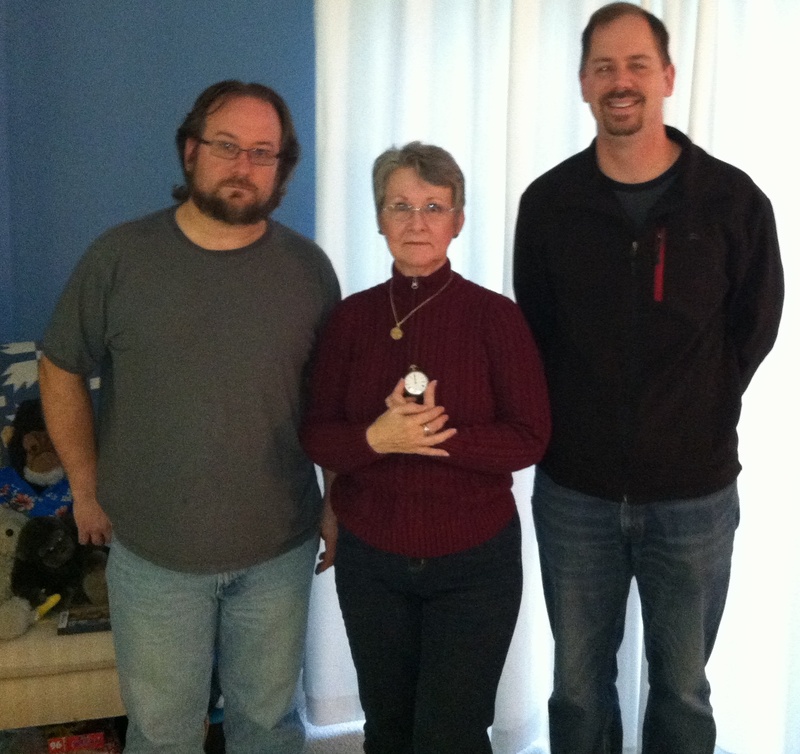 This photo shows Ann and her son Jim (R. H. Smedley's grandson) with Chad and the WW1 watch. Cyber Monday Sale Flip-Pal Mobile Scanner TODAY! The Flip-Pal Mobile Scanner Cyber Monday Sale ! Save $15 on the Flip-Pal mobile scanner! 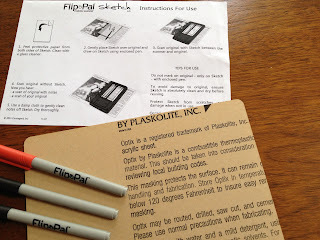 You will need to place the Flip-Pal Mobile Scanner in your shopping cart and then use the promotion code Cyber12 in order to receive the $15 off discount. Save $20 on the Flip-Pal Mobile Scanner “Pink” Bundle—helping the National Breast Cancer Foundation! Save $25 on the Flip-Pal Mobile Scanner Rechargeable Bundle! Save $50 on the Flip-Pal Mobile Scanner with Creative Suite Craft Edition DVD Rechargeable Bundle! Save $55 on the Flip-Pal Mobile Scanner with Digital Creativity Suite 3.0 DVD Rechargeable Bundle! 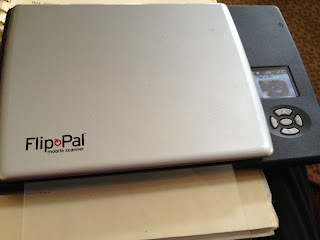 The Flip-Pal Mobile Scanner Cyber Monday Sale Preview! The Flip-Pal Mobile Scanner Black Friday Sale! IMPORTANT: Use this link to Flip-Pal Mobile Scanner and look for the Black Friday buttons on the bottom left of the page on Friday Nov. 23rd. Save $20 on the Flip-Pal Mobile Scanner + Deluxe Carry Case Bundle! Save $30 on the new Genealogy Bundle! Save $50 on the Really Big Bundle! 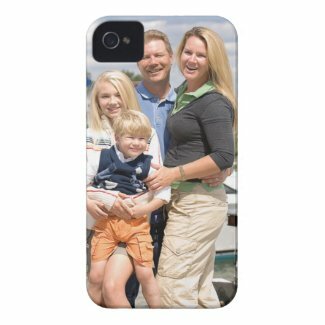 Need the perfect gift for someone who has everything? Or have a "hard to shop for" person on your list? Give a gift they'll always treasure-an opportunity to connect with their family! 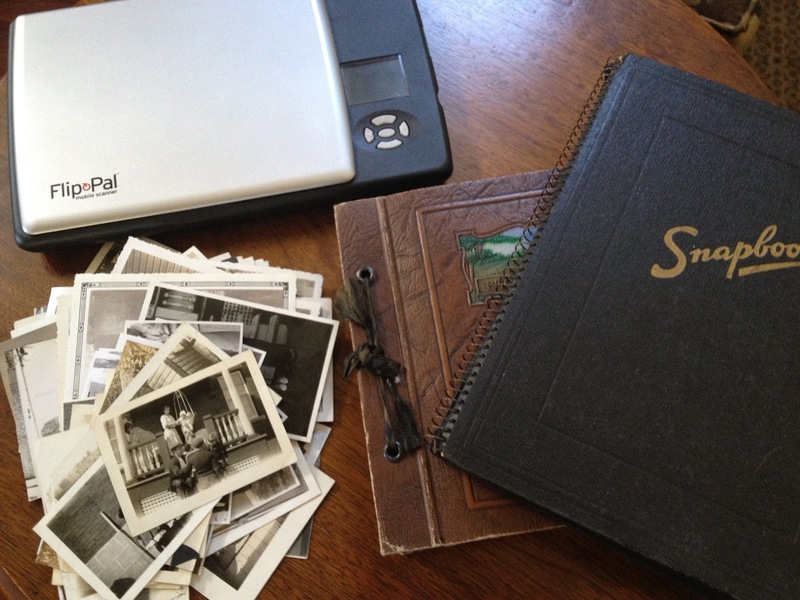 RootsTech, a Family History and Technology Conference hosted by FamilySearch, provides a unique opportunity for anyone to find, organize, preserve, and share their family's connections and history. And with passes starting at only $19, it's a great gift to give everyone on your list! With world-class content from speakers all over the country, a large and exciting exhibitor hall, and great keynote speakers, RootsTech is for young and old alike, regardless of expertise. Full admission for just one day. A selection of fundamental classes to help you get started. The Flip-Pal Mobile Scanner Black Friday Sale Preview! 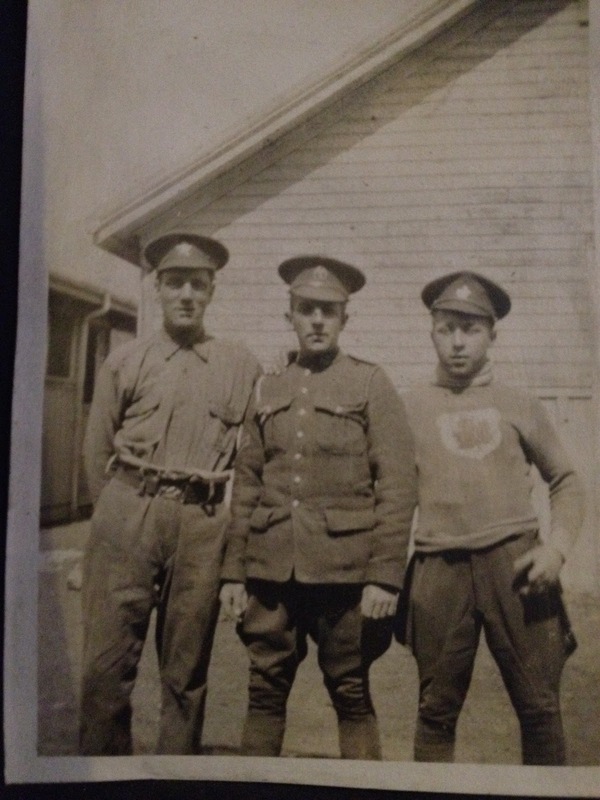 This is the 4th photo in our collection of rescued photographs of the Hooper and Squires families of St. Mary's Ontario Canada. To view all the photos in this collection as they are published here on Olive Tree Genealogy blog, click on Hooper-Squires Photo Archives link. 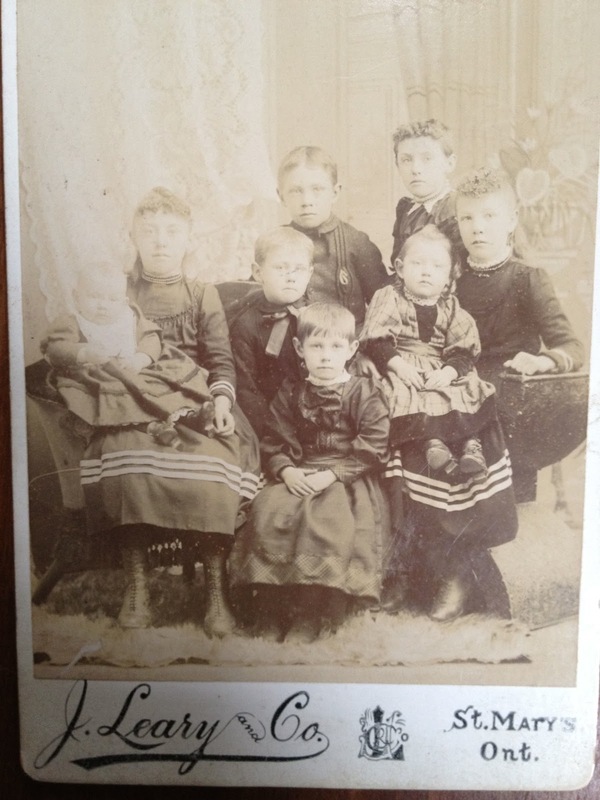 This Cabinet Card photo is faded but still adorable. Eight young children in their Sunday best in St. Mary's Perth County Ontario. The photography studio, J. Leary and Co., was in operation in St. Marys between 1891 and 1896. 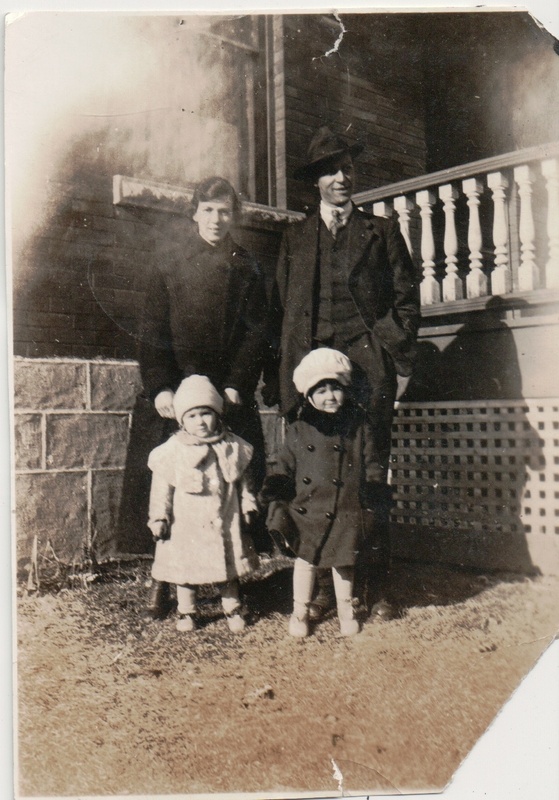 This helps date this photograph and aids in identifying the family. If I am correct this photo was taken circa 1892-1893. 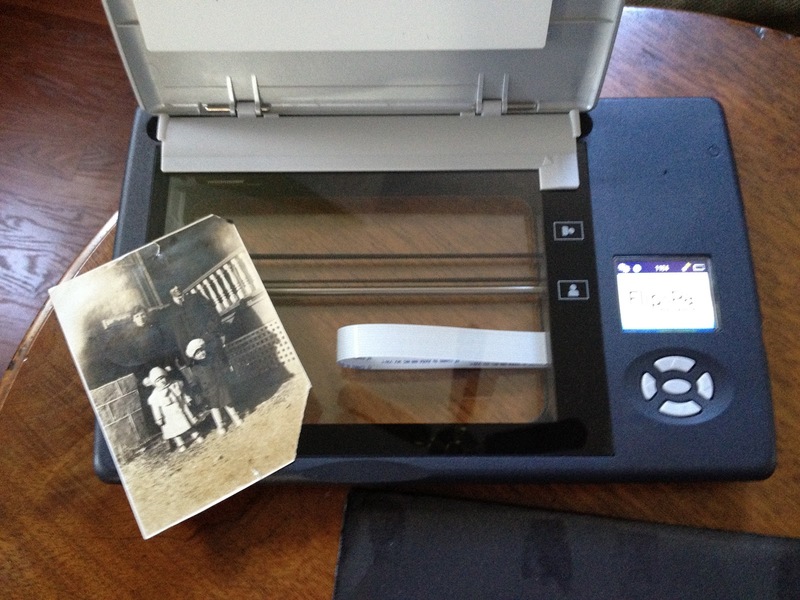 Sketch Kit is a piece of plastic that fits on your Flip-Pal Mobile Scanner bed and allows you to notate photos and documents you are scanning. 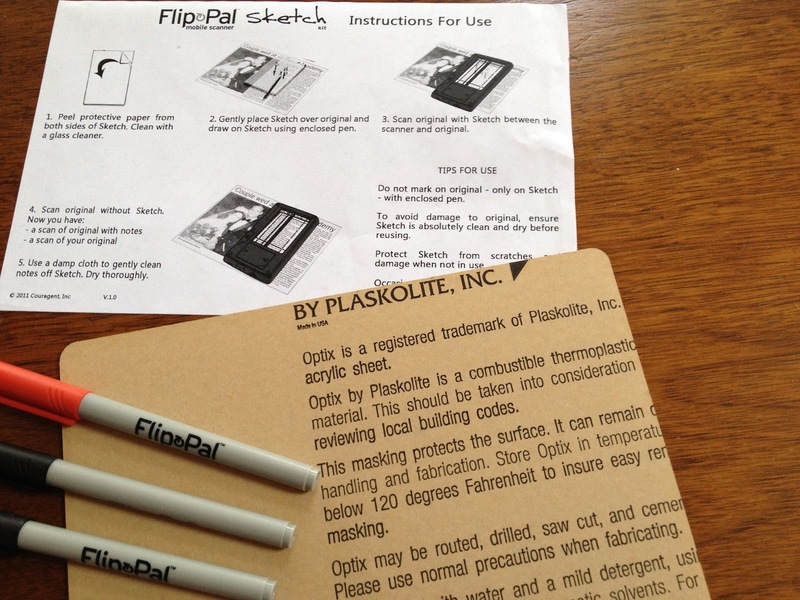 The Kit consists of the plastic insert and three dry erase markers. All you do is peel off the paper from both sides of the plastic sheet. That's the hardest part of using Sketch Kit! Once you have it peeled off, you are set to scan. I took a photo of my grandparents, my mother and aunt taken circa 1920. First I scanned the photo. I should also mention that I did all this from my lap while sitting on my couch! Ignore the printed material you can see through the glass of the Flip-Pal mobile scanner - that's just a thin book I used to stabilize the scanner while I was using it. Next I verified with my aunt that I knew who each child was, and I wrote the information on the plastic sheet with the dry erase marker. Next step was to place the photo on the Flip-Pal Mobile Scanner bed again, and then put the plastic notated sheet on top (with the writing facing down the same way as the photo). 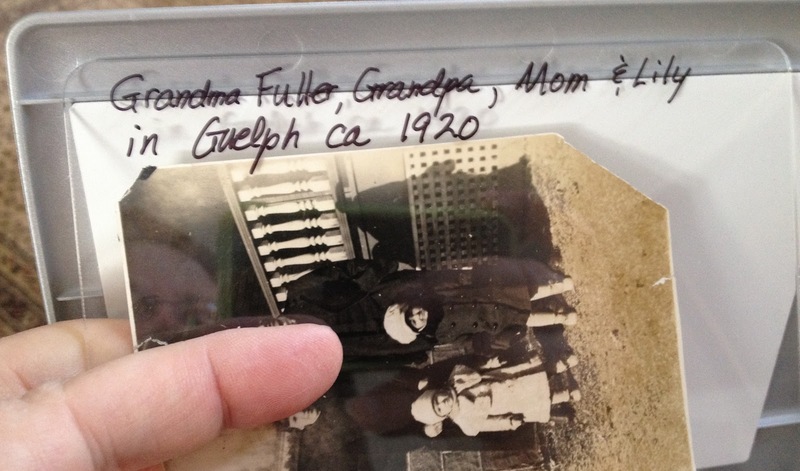 After scanning the photo with the notated plastic sheet, I then had two scans - the photo with no information and the photo with the names and date. What a great thing to have handy when I'm out at a museum or archive or library and I want to notate a document with the source. This photo shows the final scan. See the bit of the plastic sheet sticking out from the scanner bed? And the final two scans are shown below. 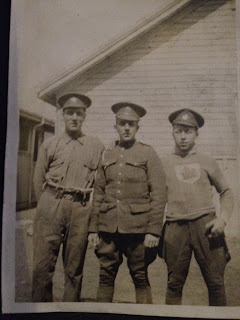 Update on Case #14 WW1 Soldier's Watch - Descendants Found! Another happy ending! I am very pleased to let readers know that we have found the daughter-in-law and two grandsons of Ronald H. Smedley. 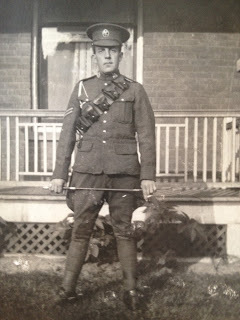 Ronald's watch which was given to him by the citizens of his home town for his service in WW1 was found by Chad. 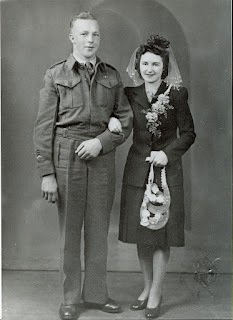 Chad contacted Olive Tree Genealogy for help finding Ronald's descendants so he could return the watch. 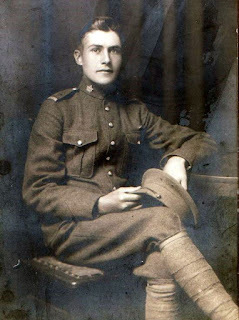 The original post for Case #14 "WW1 Soldier's Pocket Watch Found in Michigan!" is here. Ronald's grandsons and their mom have all posted comments on the original post with the story of the watch (see below). It's great to hear from Ronald Smedley's family (Ann, Ronald and James) but please contact me directly. I will put you in touch with Chad, the finder of the watch. Replace AT and DOT with the appropriate symbols. Hello both my brother (Jim H Smedley) and my mom( Ann Smedley) have already left a comment so basically I wanted to reconfirm what they both said. This watch was taken from our home while we were on vacation and thought that it was lost forever. i fondly remember looking at it in its case when i was young. 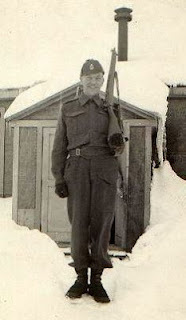 unfortunately my grandfather passed away before i was born so i have no personal memories of him other than pictures and few items my parents had of his( the watch being one of them). it is amazing that after all these years it has resurfaced! i just wish that my father was still with us to enjoy the discovery of his father's long lost watch. i want to put out a huge thank you to the person that found it and wanted to find the proper owner and would love to meet them to give them a personal thanks. 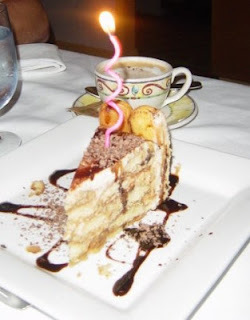 For your Birthday I'm giving you a free MyHeritage yearlong subscription to give away however or whenever you like. Mark added that he couldn't give a subscription to me because I already have one! So he thought it would be fun for me to give one away. The 27th person to email me at otg.giveaway@gmail.com gets the membership! Congrats Judy and thank you to Mark and MyHeritage! 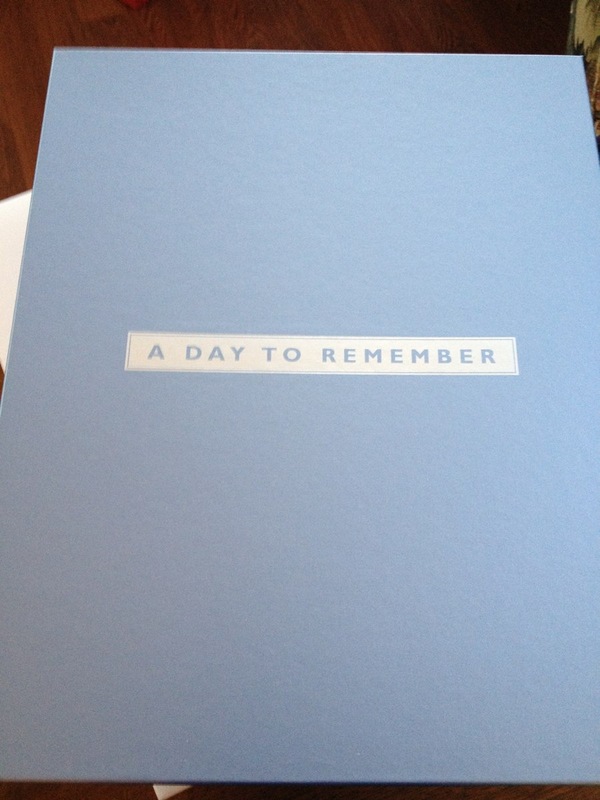 I'll announce the winner here as soon as I hear from the 27th person. 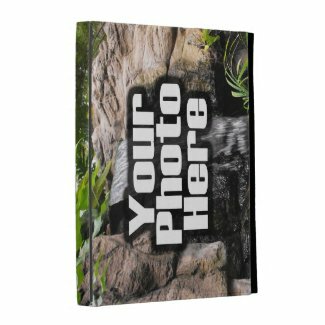 Don't forget to give me your full name and email in your note. No need to tell me why you want the membership, just email me. 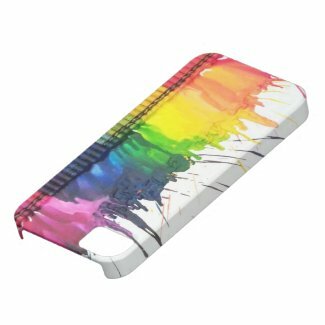 Did you know that you can create your own covers for your iPhone or iPad? I've been working on a genealogy design that features either a family tree (my own of course!) 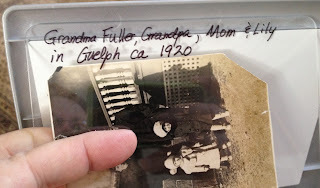 or a collage of ancestor photos so that I can give my kids a custom cover for Christmas. Olive Tree Genealogy is taking a day off. Yes!! Today's my birthday and my husband has planned what he calls "Reenie's Day of Fun"
I'm going to be enjoying four of my favourite activities - dining out, cooking, antiquing and technology. I won't actually be cooking today, but I will be poking around one of my fav kitchen stores looking for new goodies to buy. First - breakfast out at a local restaurant. Then to the city to the kitchen store. Then it's off for lunch at a restaurant I love but rarely get to. I can smell those Red Lobster biscuits already! 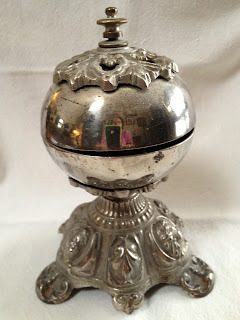 Lucky me I then get to go to an antique store where hubs has told me to choose one of the antique silver desk bells I've been drooling over. I collect them and have been longing to buy another to add to the collection. Then a technology store I love to check out the new mini iPad and other stuff. Wow - Reenie's Day of Fun starts now! 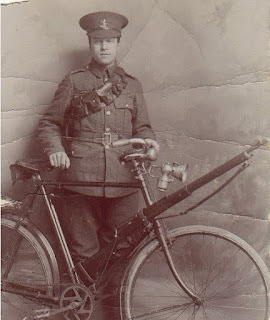 I'll be back tomorrow with genealogy news. 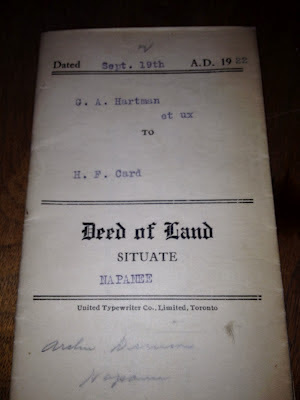 This is a Deed of Land dated 14 September 1922 in Napanee. 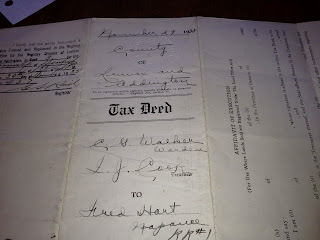 It is signed Archie Denison but the parties involved are George A. Hartman and his wife Edith Victoria to Henry Forguson Card, Agent. 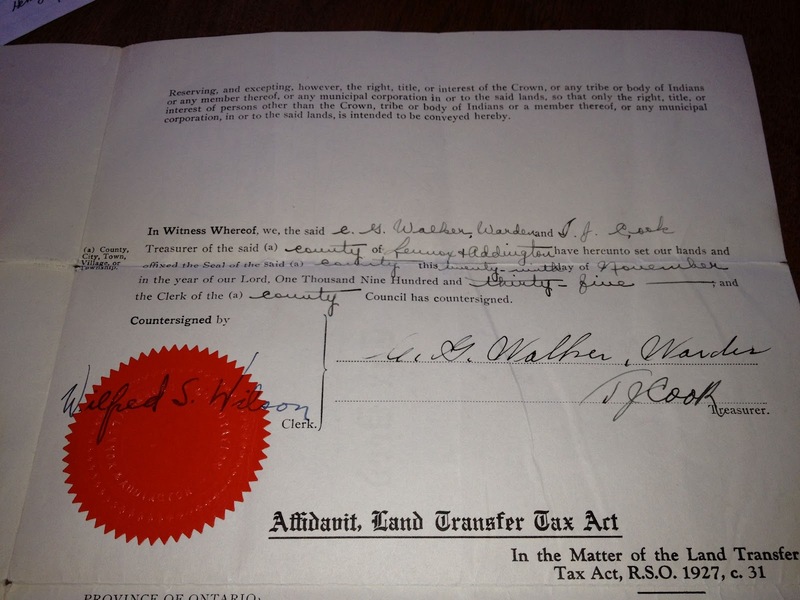 A payment of $1.00 is given for a half interest in Lots 1 and 2 on the North side of Dundas St. The document states that the land is described in detail in a deed from Mary Adney Foster to George Albert Hartman and Henry Forguson Card dated 8 March 1920. The following announcement was sent to Olive Tree Genealogy from Family Tree DNA concerning their current sale on DNA kits. To order this special offer, log in to Family Tree DNA to your personal page and click on the Order An Upgrade button in the upper right corner. ALL ORDERS MUST BE PLACED AND PAID FOR BY MONDAY, DECEMBER 31, 2012 11:59:00 PM CST TO RECEIVE THE SALE PRICES. 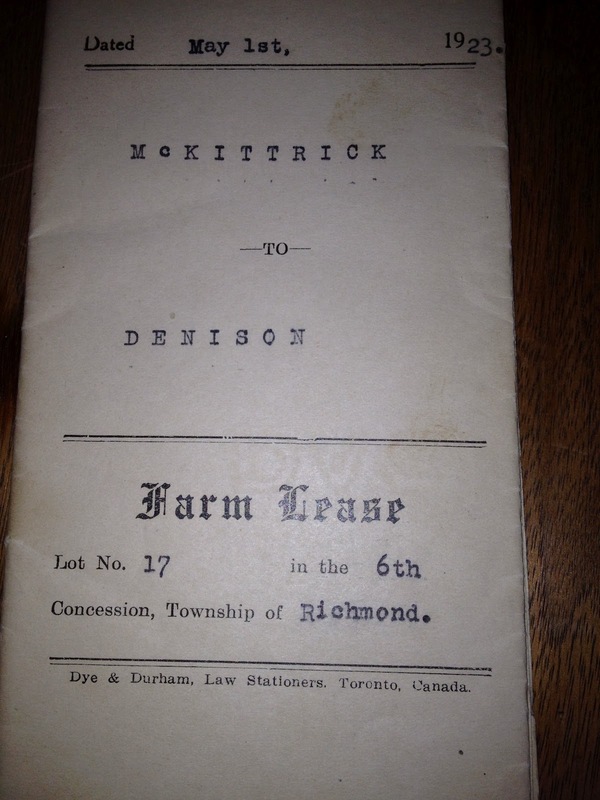 Details: Matilda McKittrick, widow, Richmond Township to Archie Dennison, Richmond Township, farmer. 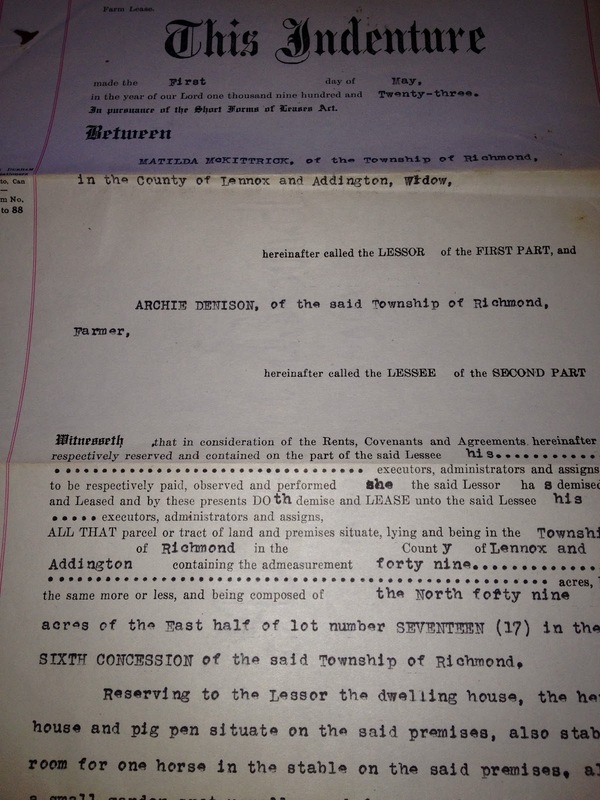 Land: North 49 Acres Lot 17 Concession 6, Richmond Township. 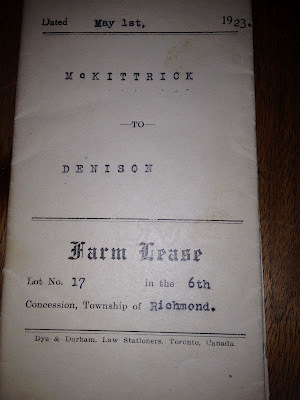 The lease is for a dwelling house, hen house and pig pen, also stabling of one horse and a small spot for a garden. Matilda McKittrick was the wife of James McKittrick. He was the son of Rebecca. 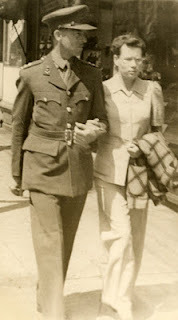 Rebecca's first husband was William Parks. 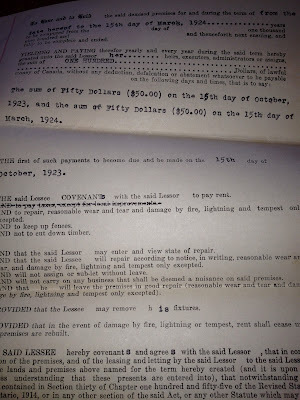 See his 1849 will.